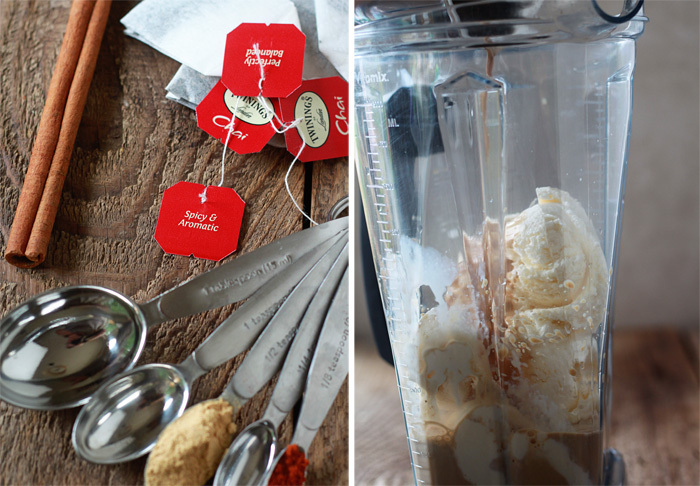 Warm chai spices and cool vanilla ice cream are made for each other. Don't skimp on the secret ingredient! It’s Milkshake Week! Otherwise known as a very good week indeed. Julie of The Little Kitchen and Lindsay of Love and Olive Oil have a week full of milkshakes (and giveaways!) planned, so when they asked if I wanted join in the fun by posting a milkshake recipe of my very own, well, I couldn’t possibly decline. 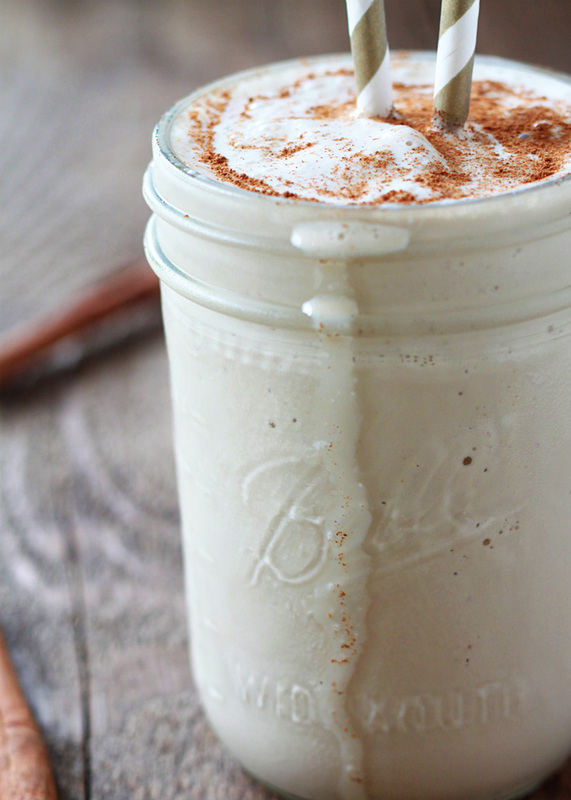 Because, hello: what a perfect reason to test milkshake recipes! Milkshakes are generally something I don’t allow myself to indulge in much, but darned if I didn’t embrace this excuse. I tried a couple of different kinds of milkshakes, but this big, shareable Spicy Vanilla Chai Milkshake was the stand-out. 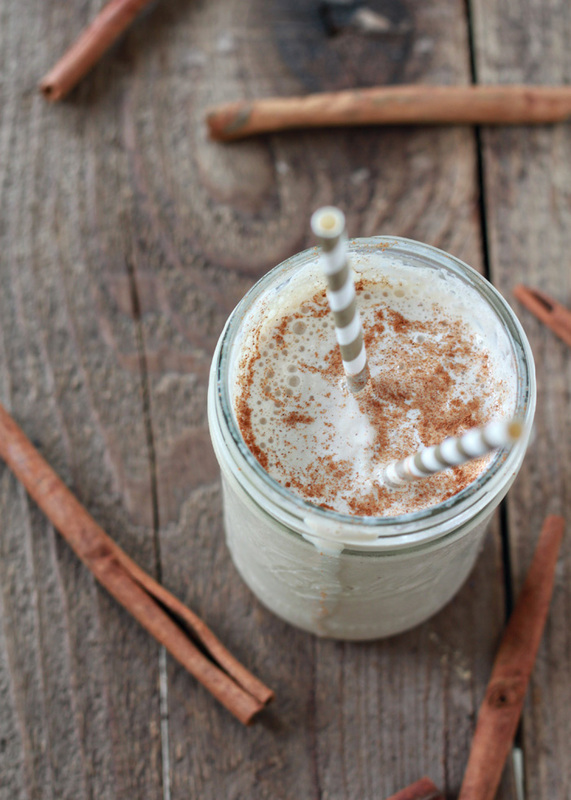 Super creamy chai goodness in milkshake form – what could be better? What really seals the deal with this recipe is an intriguing “what is that?” heat that sort of creeps up on you and then is instantly cooled off by the creamy dairy. This super-secret mystery ingredient? Here’s a hint. Oh, I can’t keep a secret for long. It’s cayenne pepper! 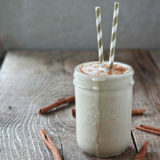 Yep, I add cayenne pepper to the mix, and I’ve gotta say I think it takes this milkshake recipe from good to sensational. It’s a pretty simple recipe overall. It’s essentially just infused milk and ice cream, and I made it even lazier by starting with chai tea and not even making it from scratch. Let me just say that I have tried and tried (and tried!) to make chai tea myself with the right blend of black tea and spices, but the perfect combo eludes me. 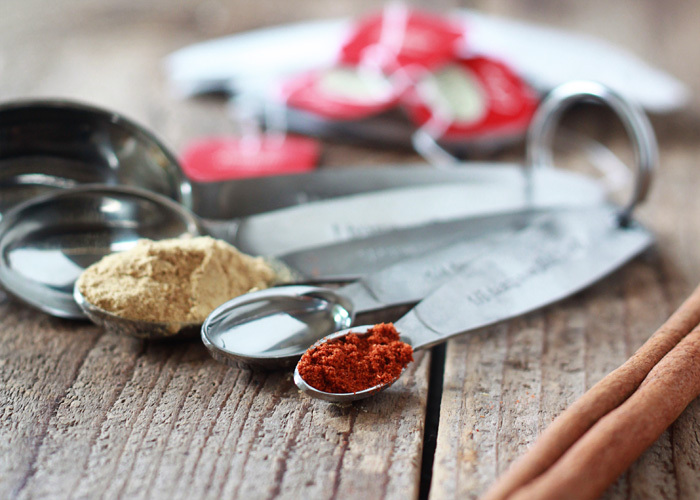 So here, I start with already-spiced chai tea bags and amp ’em up with ground ginger, cinnamon, and – yep – cayenne. After the concentrated chai-flavored milk cools off, just whir it up with vanilla ice cream and, voila! 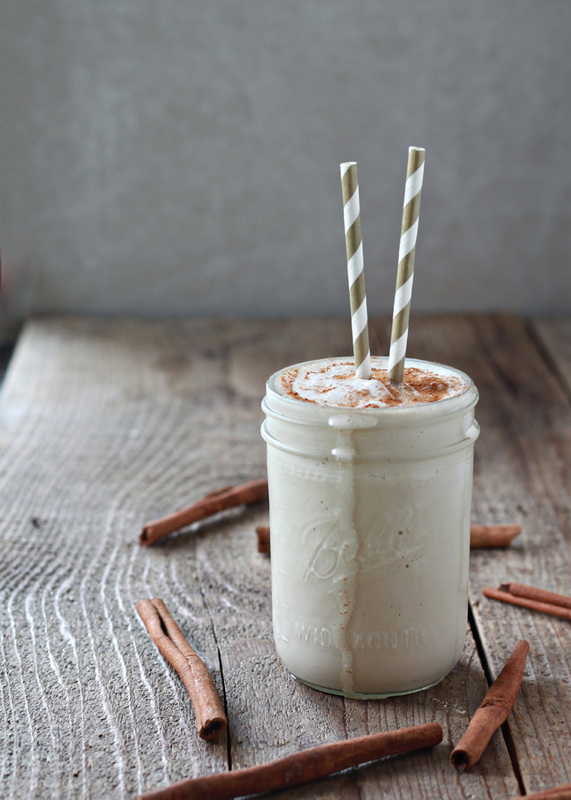 Chai milkshake goodness. This recipe makes one large milkshake. Either indulge proper, split it in two, or plop in two straws for a shareable shake. Pour milk into a small saucepan set over medium heat. Stir in ginger and cayenne. Add the tea bags and cinnamon stick, dunking to submerge. Heat, stirring occasionally, until steaming and just below a simmer, about 5 minutes. Remove from heat and let steep for 5 minutes. Remove tea bags. Stir in vanilla extract. Let cool to room temperature. Remove cinnamon stick. Add ice cream to the pitcher of a blender and pour chai milk mixture over the top. Blend until smooth. Pour into a large glass and sprinkle with ground cinnamon. Serve. Be sure to visit these other blogs for more fabulous Milkshake Week recipes! Oh my gosh, this sounds cozy..a word I never thought I would use to describe a milkshake! And Cayenne?! Totally inspired! I love that you made your own chai within the milkshake. I love anythng with Chai and I’m sure this milkshake is ‘to die for’. Love love love this milkshake! My husband and I absolutely adore unexpected heat in a dessert, so the cayenne here sounds awesome. I love chai tea so much, and this recipe looks like a perfect indulgence to me 🙂 Chai Carrumba indeed! Oh boy, guess what I am making in my brand new blender on my almost finished brand new kitchen! YUM! And thank you…. Such a great idea to add a little spice! I bet this is so addicting! Is this an acceptable alternative to my morning coffee?? 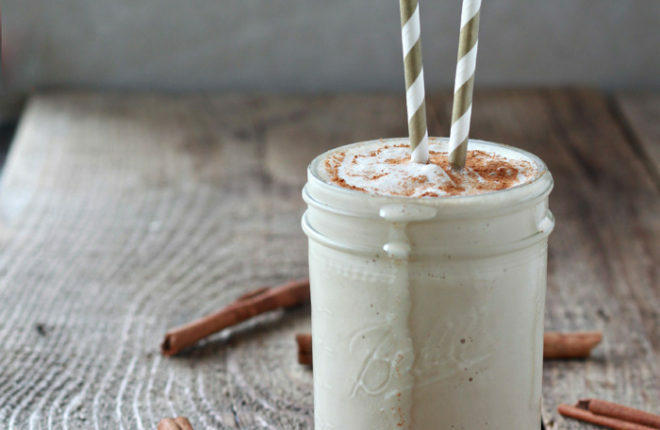 Looks delicious and love chai! Oh. My. Goodness. This is brilliant! As soon as I hit submit, I’m going to dig my chai tea out of the cupboard. (It’s been sitting there since the snow melted.) And I love the idea of upping the flavor with extra spices. I love this so much…great way to enjoy chai in the summer! Trying it next, Kare! Thanks! Absolutely throw a couple of crushed cardamom into the mix if you like! I honestly cheated all around because I start with chai-spiced tea bags. I just like enhancing the flavor with a bit of ginger, a stick of cinnamon, and cayenne. Adding a bit of extra cardamom flavor sounds pretty awesome, too. this looks almost too good to drink! i could definitely down a glass right now, you can never go wrong with the flavour of vanilla and chai together. love it! this is a great way to break up my morning breakfast routine and try something different…and healthy!